Fall is here! The temperature is finally reaching sane digits and the kids are almost on fall break. Wait?!? What? How did that happen so fast? No worries. 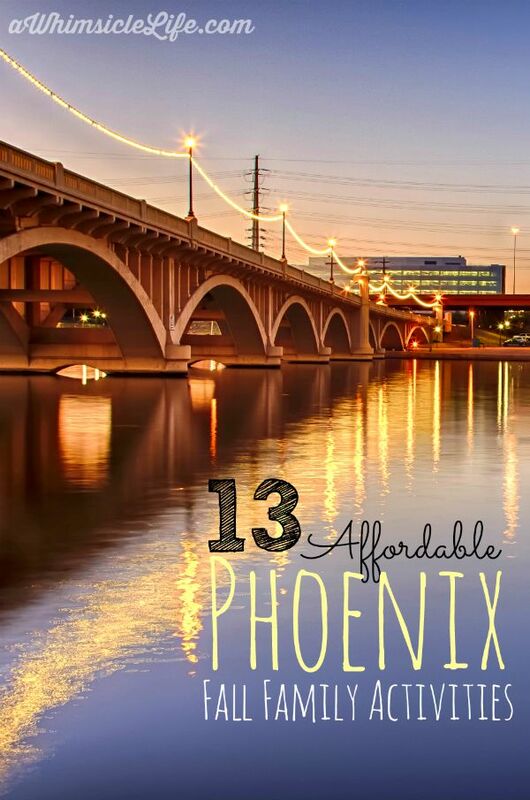 I have tons of ideas on affordable Phoenix family activities. Want an aerial view of the Sky Harbor tarmac without getting on a plane? The Sky train is free, fun and an brilliant way to spend a few hours. Plan this around noon and break for lunch in one of the many fantastic restaurants in Terminal 4. While you are there, peruse some of the museum exhibits. This month features the past of airline travel with displays of menus, matchbooks and other items given to passengers in the 1960’s and beyond. If its your kid’s first visit to the airport, stop by the information desk and tell them! Your child will get a little plane as a souvenir. Before you leave, make sure to stop by the La Grande Orange counter for a Salted Chocolate Chip Cookie to take home. You will not regret it. YES, you get to eat the chocolate! Cerretas’ is located in Glendale and has tours available as well as tasting packages and an opportunity for kids to make their own chocolate pizza. Bratwurst, oompa music, strudel… where can you go wrong? And beer and wine available for the adults! The Tempe Oktoberfest (October 9-11) has an awesome kid’s section with carnival rides, arts and crafts and a passport which you can take around the fest and earn a free cookies. The Peoria Oktoberfest (October 3) has a Kinder Village with inflatables. Yes, it’s fall!! WE CAN FINALLY PLAY OUTSIDE IN ARIZONA!! That said, the parks in the Phoenix area are top notch. Be amazed by the climbing tower in Riverview Park in Mesa. Play on the world’s first EVOS playground, a suspended structure, at Sahuaro Ranch Park in Glendale. Ride the zip line at Tumbleweed Park in Chandler. It holds grown-ups and kids as you can see. Lay on a bed of nails. Watch open heart surgery. Learn computer programming from Mark Zuckerburg. Just the typical day at the Arizona Science Center. Best to plan your visit for first thing in the morning when the museum opens as the exhibits can get rather crowded. Also, if you’re lucky, you can nab a culture pass at your local library which grants you free admission for two. We have two zoos in Phoenix! Two! I’m so excited because I just discovered the other zoo this past spring. First, the Phoenix Zoo provides a remarkable experience with beautiful exhibits, a wide variety of animals and it’s also available on POGO pass which grants each POGO pass holder two free admissions. The second zoo is the Wildlife World Zoo & Aquarium which is located on the far west side of town. Even if you live in the East Valley it is worth the drive! This zoo boasts a sky ride, kangaroos and one the world’s only albino alligators. Have you been bowling recently? If not, do you remember how fun it is? There are tons of local bowling alleys that provide a great family experience at very affordable prices for day games. If you want a more extravagant bowling experience, trek out to FatCats in Gilbert at Baseline and Greenfield. Not only does FatCats have bowling lanes (with ramps available for little ones) but you can also find an arcade, glow mini golf and a full size movie theater with recliner seats! FatCats is available on POGOpass and gives each pass holder 1 game of bowling per week and 1 glow golf game a month. Please note the POGOPass deal for FatCats is only available on weekdays. Although AZ mornings are picture perfect in fall, the afternoons are still rather toasty. Yay for McDonalds! Pick an afternoon, get a coffee or soda for yourself (or McFlurry) and let your kids run wild on the playground while you enjoy free wifi. Or go to Makutu’s Island which amazes me every time I step foot through the door. Makutu’s is a “big kid’s” playground paradise with a three story tree, tunnels and cat walks. Plus, I recommend staying for lunch. The cafe serves Four Peaks beer and really tasty pizza. Makutu’s Island is available on POGO pass and gives each pass holder 2 free visits a year. FYI: Makutu’s recently opened a toddler/ preschool play time every Tuesday and Thursday at 10:30am. During these times, toddlers and preschoolers plus their accompanying adult get in FREE! It’s the perfect time to visit without worry about your little one getting run over by a ten-year-old. Plus, there is story time. Yes, it is still baseball season. Our Dbacks are not going to playoffs this year but that means that there are tons of great seats available for the remaining games. Kids have tons of fun at DBacks games! The remaining home games occur September 29th – October 4th. Bleacher seats can be purchased for $10 a piece. See a real jail and say “hi” to dinosaurs at the Arizona Museum of Natural History. Then, go next door and let the kids go wild at the IDEA Museum. The IDEA Museum has the added bonus of being available on the POGO pass. Remember to bring your socks if you go to play with kids under 5. Or go downtown and explore a real Victorian mansion at the Rosson House. Sit outside at the Gilbert location and let the kids play ping pong, corn hole and miniature golf while you wait for your food. If you are near the Central Phoenix area, stop by Snoh Ice Shavery for an amazing dessert that is part shaved ice, part ice cream and loaded with tasty toppings. Libraries in the Phoenix area are fanastic! Not only can you find a story time happening any day you would like, but libraries also boast activities for older kids. The Chandler Downtown location has an art workshop on Saturday October 10th. The Main Mesa Library hosts a Mad Science workshop on Wednesday September 30th. Your kids can even become toy scientists at the Burton Barr library on October 3rd. Plus, did I mention the Scottsdale Main library has a castle? Because it does..
Fall time means time for hay rides, pumpkin picking and amazing fall food. The Vertuccio Fall Festival is a favorite of mine because the farm is small but still has tons of activities for the whole family like a corn maze, a giant slide, train ride and air pillow. For more fall festivals and activities, check out this Fall Fun Map and also Experiencing Parenthood’s article on Fun Fall Activities. Now you have more than enough activities to keep you and the kids happy during those weeks off from school. And if all else fails, an ice cream date can’t be beat. At least our fall is still warm enough for ice cream. Oh let’s face it, our winter is warm enough for ice cream too. Arizona rocks that way. What a great list! Thanks for linking to mine! I haven’t heard of some of yours – definitely adding to my fall to-do list!